So how can one climb out of this oblivion and learn to tame the inner dialogue that plagues many of us, thus preventing us from living happy, functional lives? There are many answers to this question that require years of time, money, and energy invested into self work through journaling, therapy, and introspection. If that sounds like a daunting task, you no longer have to fear if the investment will be worth it or not. 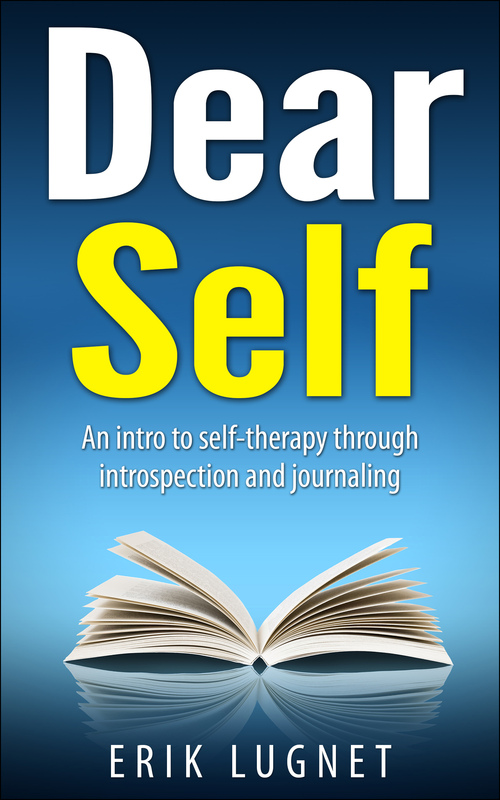 With Erik Lugnet’s 17 page introduction to introspection, Dear Self gives you a quick and concise glimpse into the world of self-therapy and journaling. If you’re thinking of going to therapy, but are unsure if it may be right for you, this book is a great guide to trying out the process on your own to see if it may be up your alley. The book begins with a list defining the traits of your True Self. It’s calm, empirical, assertive, honest, empathetic, curious, and compassionate. If you feel that you may have lost these traits due to the hardships of life, Dear Self makes a case as to how and why you could go about reclaiming your greatness. Erik invites you to be curious and compassionate with yourself, and usually it does help to calm the storm in your head, but that’s not enough. Reworking your inner dialogue can be made easier by journaling and Dear Self briefly touches upon different mediums from the traditional longhand, to audio and possibly video. (What do you think vloggers are doing?) The invitation to write out your emotional experience in a gentle and patient way is possibly one of the simplest, but most powerful suggestions made in the book. Then of course there’s also a small glimpse of Internal Family Systems to help understand the ambivelance most, if not all of us experience when it comes to understanding our emotions and motivations. You do not need to be fully educated in the IFS approach to understand this aspect of Dear Self (though itis suggested) because it is explained in such an obvious way. Basically, our entire beings are comprised of different sub-personalities, and Erik’s main principle remains: learn how to approach these parts with curiousity and compassion. At the beginning of the book, the caveat is put forth that a lot of what is shared is due to personal experience. I didn’t get that impression until much later in the book when Erik begins to talk about specific examples from his real life, most notably in the closing section that barely scratches the surface of the journey he’s been through. I believe that more examples of his own IFS conversations and journaling experience could have enhanced those sections to make the book feel less formal and more intimate, since intimacy with The Self is what this book is meant to promote. Furthermore, in the section covering where The Self has gone, there is the example of a mother who is easily disturbed by noise, and how that might affect how she would raise her child as just an inconvenience. I think that example could have been fleshed out more if there was a bit more detail about how and what may have caused her aversion to loud noises by going into her history with possibly being yelled at, or witnessing loud confrontations between her parents to drive the point home. There are also a few misplaced commas and syntax errors a simple re-read can fix, but all in all, Dear Self is a quick and concise read that should help you start on your path to self-knowledge. A revised and possibly a slightly extended version can help work out the kinks of this powerhouse of a debut book. If you’re still wondering if the investment in yourself is worth it, I would argue that it would be. Because self-knowledge is a fundamental human trait, and without it, how can we possibly know how people relate to us if we don’t even know ourselves? You can download Dear Self by Erik Lugnet for free at Smashwords, or if you’d like to support my friend and purchase it for $0.99, you can do so at Amazon!